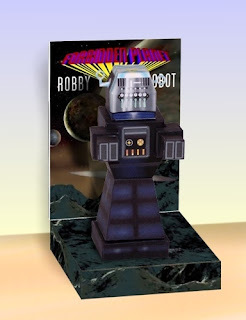 Entitled "Robby the CubeBot", this robot papercraft is a hako version of Robby the Robot from the classic 1956 Science Fiction movie, Forbidden Planet. 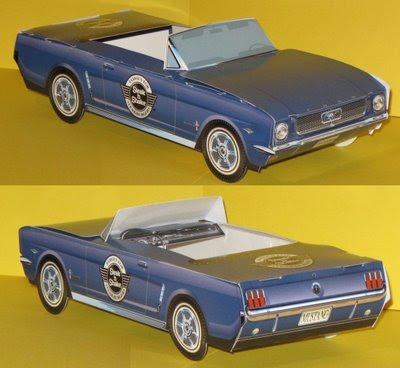 The template was designed by Hobby Talk Forum member "Airdave" and is available here. 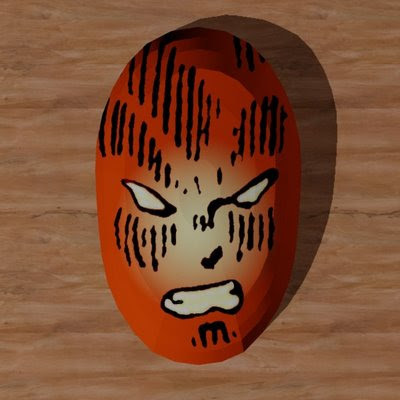 Once upon a time, it was possible to download a realistic papercraft Robby from Japanese designer "Uhu02", but as far as I know the model is no longer offered. If that is the case, then this hako version may be the only free papercraft of Robby currently available on the Internet. 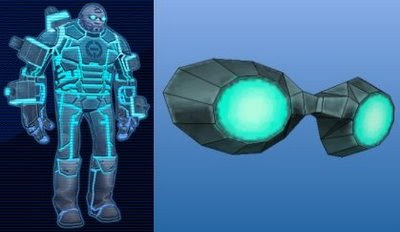 In the Stars Wars universe, holocrons are crystal-lattice devices into which both the Jedi and the Sith record their experiences and knowledge for future generations. Jedi holocrons come in a variety of geometric shapes, while Sith holocrons are typically pyramids. 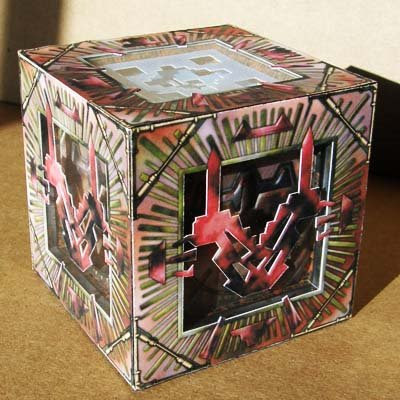 This cube shaped Jedi holocron papercraft is the work of "Exxos" who modeled it after a holocron which appears in the Tales of the Jedi series of comic books by Dark Horse Comics. A PDF template is available here, but be forewarned that (other than the above photograph) there are no instructions included. 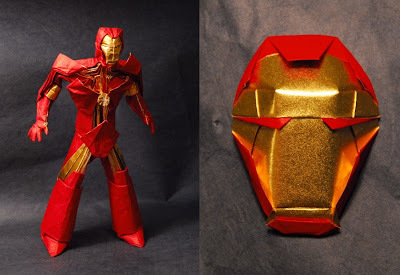 These two Iron Man origami pieces were designed by origami artist Brian Chan in 2008. Each was folded from a single square of paper. To give you an idea of the scale, the mask is about the size of the palm of your hand. If you would like to give either one of these pieces a try, Brian has graciously provided folding diagrams here. 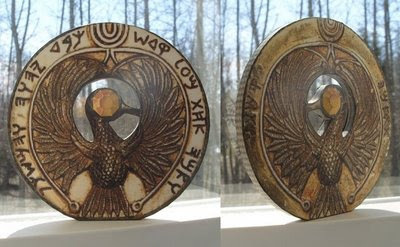 Joe in North Carolina did an excellent build of my Headpiece to the Staff of Ra papercraft, so I thought I would share some of his photos. I have to say I think he did a better job on his than I did on my own. ^^ Great work Joe! Here's another papercraft based on a 3D model from the Star Trek Voyager Elite Force video game. 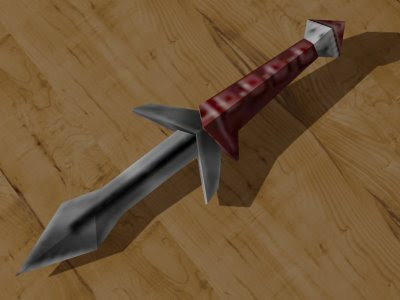 This is the game's version of the D'k tahg, the traditional Klingon warrior's knife. The knife is seen only briefly in the video game when the player must attempt to sneak past a Klingon enemy who is busy eating some meat. Construction tip: Build from the blade downward. Doing so makes it easier to reach inside and hold the flaps down while the glue drys. 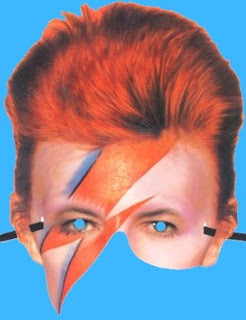 This printable paper mask depicts British singer David Bowie dressed as one of his many personas. This particular Bowie persona shares its name with his 1973 album, Aladdin Sane, the name being an intentional pun on "A lad insane". The mask is offered as a free download on the multimedia page of the David Bowie Wonderworld Fan Site. Other multimedia downloads on the page include ring tones and video games. 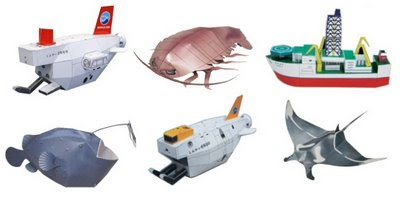 From the Japan Agency for Marine-Earth Science and Technology (JAMSTEC) comes a nice assortment of deep sea papercraft. 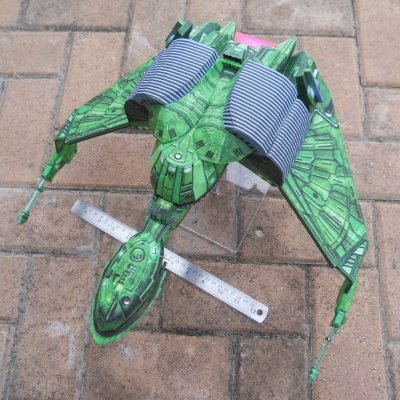 In addition to eight sea creature papercraft there are papercraft of two submarines, a ship and an oceanographic buoy. My favorite is the manta ray. PDF templates for each of these may be found at the JAMSTEC Papercraft website. Just click on the photos once you are there. 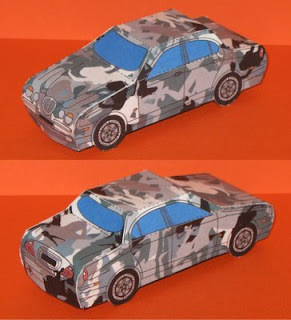 This two piece papercraft Jaguar comes from the company website (Japanese version) of British fashion designer Sir Paul Smith. What at first appears to be a typical camouflage paint scheme on closer inspection is actually overlapping silhouettes of women reminiscent of the typical opening credits of a James Bond film. A PDF of the Jaguar template may be downloaded here. 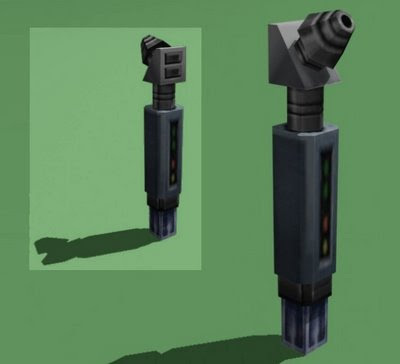 "In the project First Person Shooter, the arm holding the weapon of the video game Counter-Strike (Valve 1999) is transferred into physical space... When a player wears the glasses, the arm holding a weapon always remains in the front, regardless of the direction in which the player moves his or her head... 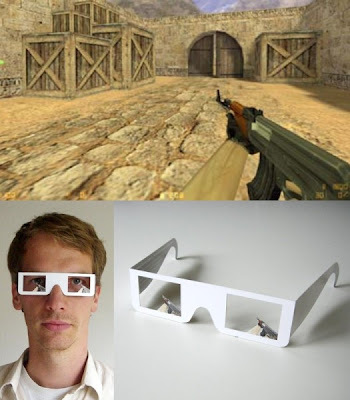 The First Person Shooter glasses are, of course, a provocation and a comment on violence in video games. By transferring the typical first-person (shooter) view to the real world, the player is confronted with his or her actions in the game. At the same time, the project shows how separate everyday life in the physical world is from virtual gaming space, with its own rules." To learn more about the First Person Shooter project visit Bartholl's website at http://www.datenform.de/fpseng.html. Look for the PDF link near the top of the page to download your own pair of the glasses. 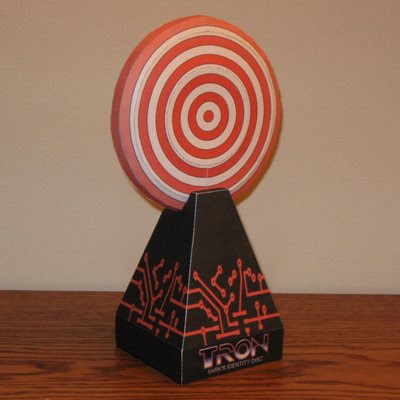 As with the Star Trek Elite Force papercraft I am doing, I will be starting simple with the Tron 2.0 models and working towards greater complexity. 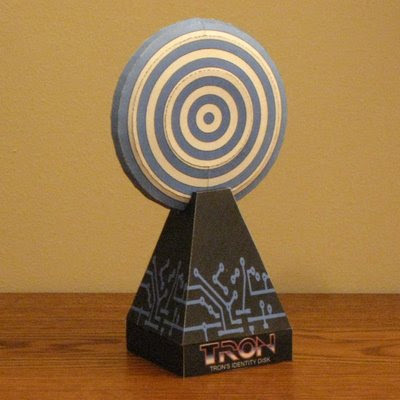 I think the more complex Tron models will be beautiful to behold with their brilliant colors and elaborate patterns. You can get a taste of what I am talking about from the image of the Hog above.